Located on the “elbow” of Cape Cod, Chatham feels like a second home to me. If I don’t go there once each year, my soul throws a tantrum. 😉 And whenever I’m in Chatham, I always visit the two indie bookstores in the center of town: Yellow Umbrella Books, which highlights used books and Cape Cod-centric novels alongside bestsellers and new releases; and Where The Sidewalk Ends, a two-floor “barn-style” shop with a children’s annex that also hosts a Literary Luncheon series during the summer at the Wequassett Resort. If you’re ever on Cape Cod, make sure you visit both of these gems! As for the books I bought between both stores… Ohhhhhhhhh am I psyched to share this batch with you! 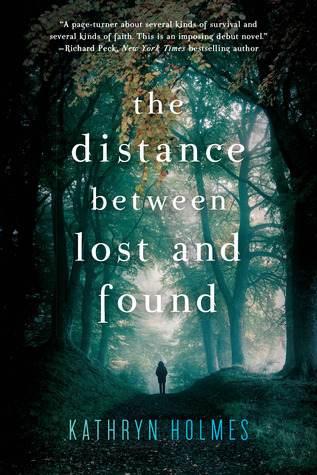 I had first heard of Kathryn Holmes’ debut novel The Distance Between Lost and Found after listening to her recent podcast on DIY MFA. The story’s premise caught my attention on its own. However, hearing Holmes talk more about her story and the importance of creating a believable setting regardless of genre convinced me that I had to read her book. Now that I have, I feel moved and uplifted by the journey I’ve shared with Holmes and her protagonist, Hallie Calhoun. The Distance Between Lost and Found is much more than a survival story. It’s about one girl’s struggle to find courage, confidence, and renewed friendship after a traumatic experience, and how getting lost in the wilderness of the Smoky Mountains with two other campers galvanizes her recovery. Holmes tackles several weighty subjects (including bullying and social isolation) during this story, and in a sensitive yet realistic manner. She also offers gradual hints about “the incident,” compelling readers to guess what happened to Hallie until Hallie herself finally reveals the truth. Normally, stories about the painful moments of our teenage years don’t appeal to me, since they remind me of my own difficulties in middle and high school. Not this time. Hallie learns to rise above her situation, and how she evolves is both encouraging and inspiring for teens and adults alike. Distance doesn’t have a huge cast of characters, and quite frankly it doesn’t need one. By focusing on Hallie and her two companions, Holmes allows readers to get to know all three characters so intimately that they become our friends. Each member of this trio also plays an integral role in the others’ physical and psychological survival in the woods: Hallie for her attentiveness and her sense of responsibility, Rachel for her humor and her listening skills, and Jonah for his Boy Scouts savvy and his gentle no-nonsense attitude. Even after finishing the novel, I can’t say I favor Hallie over Rachel or Jonah, or vice versa. They’re all important and lovable characters in their own right. Another aspect I enjoyed about Distance was its emphasis on setting. The Smoky Mountains becomes its own character, an expansive and lushly beautiful spirit with a will of its own. Every natural element (flora, fauna, rock, and weather) poses a potential threat; and while Holmes doesn’t shy away from putting the three campers in danger, she lets each peril creep in one by one to avoid overwhelming the reader. Holmes also excels with planting us in the wilderness by engaging our senses. Sound, color, smell, taste, touch – in every possible way, readers feel like they’re also wandering through the forest and bonding with nature. Religion can be a touchy subject for some readers, so I’m making a point to say that Distance touches on the subject. That said, the book doesn’t preach any particular beliefs. It instead uses spirituality as a catalyst for exploring all kinds of faith – not just religious faith, but self-confidence (faith in oneself), loyalty (faith in others), and trust. I consider myself agnostic, but I wasn’t offended by the few times when Hallie, Jonah, and Rachel talked about God and whether they believed in Him. The topic rises naturally from the characters’ circumstances, and only when necessary. What amazes me the most about The Distance Between Lost and Found is how it wasn’t even a blip on my radar until the week of its release. Now, it has a serious shot at being one of my favorite reads of 2015. This is a vividly written, beautifully structured window into the triumph of truth and the human spirit. And with all the news flashes about bullying and the heartbreaking damage it can inflict on children, there’s never been a better time to meet a literary character who chooses not to be a victim. Even if you only read YA contemporaries on occasion, make some time this year for Distance. Even better, share it with a young reader who can benefit from Hallie’s story. Have you read The Distance Between Lost and Found? What did you think of it? If you haven’t read it yet, do you think you might check it out based on what you’ve read above? Let me know by commenting below or visiting the same review at Amazon or Goodreads.